Welcome to the Universal Accessibility Blog! Here you will find weekly articles on various topics relating the accessibility in your home, the workplace, in the general public, and anything else related. If you ever have a suggestion for a topic that we should cover, feel free to message us on Google+ or Facebook. We want to hear from you! Also, we'll be posting links to all of our articles on these social media channels, so we encourage you to engage with us! Accessibility and mobility are challenges many physically impaired people face. Like Anchorage Alaska resident Blaine Miller. Having found it difficult to get adequate taxi service for his frequent trips to Ted Stevens International Airport, Miller has taken to arranging for cab service the night before and offering an additional $100 if the driver arrives on time. Without such an incentive, Miller has found himself waiting hours for a taxi to arrive, if it arrives at all. Unfortunately, Miller’s story is not unique. Fellow Anchorage resident Ric Nelson has given up all together going out for a night on the town with his friends for fear of being stranded. Although Anchorage’s two cab companies have vehicles equipped with vehicle wheelchair lifts, disabled residents still appear to have issues receiving adequate service. Communities all over are recognizing the challenge of some of its residents to live a full and active life. Residents of Jessamine Kentucky have taken to having an annual fundraiser, Walk MS, that provides not only research dollars and financial assistance to local residents with multiple sclerosis, but it also provides for vehicle wheelchair lifts for residents in need. American Legion Post 328 in Norco California was recently donated a twelve-passenger bus to accommodate the transporting of some of its members. Equipped with a vehicle wheelchair lift the bus will improve the quality of life for veterans in the area and grant them the opportunity to be more mobile as well as more social. Thanks to the Americans with Disabilities Act, citizens with physical impairments now have equal access to public facilities as well as public transportation. Unfortunately, citizens in more rural areas as well as those wishing to maintain a greater level of independence still find it difficult to live a full and active life. As is evident in Blaine Miller’s story and the efforts of the Jessamine community, vehicle wheelchair lifts can be a saving grace in the lives of our physically impaired neighbors. Independence is a fundamental part of overall quality of life. With that in mind, we believe everyone should have the opportunity to maintain their independence throughout their life. Let us know what your comments and thoughts on Google+ and Facebook! There are many reasons that businesses in your community will want to learn more about ADA compliance. Not only is being complaint a way to give back, it's also a way for businesses to make the community a better place overall. Some corporations just love to give for the good PR, free advertising and tax perks it can bring. Some businesses just enjoy being part of their community, and want to do positive things while their businesses thrives within it. Making an establishment ADA compliant means that more customers will have access to its products or services. For this reason, installing vertical lifts, handicap elevators and commercial wheelchair lifts is a no-brainer for any business owner. Disabled people are an asset to the US workforce. According to recent statistics, around 12% of the US population has a disability. 11.8% of those individuals have completed some college education or have an associate degree, while 7.1% have a bachelor's degree or higher. In addition, many disabled people do have the physical capacity to complete many tasks. They also want to work to earn money and contribute to a workplace environment. It's often a rewarding arrangement for both employer and employee. The word turn-key is often music to an entrepreneur's, manager's or CEO's ears, especially when it means he has access to something really stupendous without having to make any changes to his normal routine. Most companies in the business of selling ADA compliant merchandise are well-versed in the process of change and really want to help the disabled by making those changes happen. Once the business' decision maker chooses to make these positive changes, there will be many people involved in helping him or her, in order to make the process as simple as possible. In our field, the Americans With Disabilities Act is a very important and very influential piece of legislation. Most people have heard of this law, but do not know much detail about it. That is why we thought we would write a post shedding light on the Americans With Disabilities Act. The Americans With Disabilities Act, or ADA, was enacted in 1990 and was updated by amendments that took effect in 2009. It's considered a civil rights law that prohibits discrimination based on ability. The landmark Civil Rights Act of 1964 did not address discrimination based on ability or disability, so Sen. Tom Harkin (whose younger brother is deaf) set about promoting a bill that would change that. A major facet of the ADA is that it required public entities at the local level (like a county courthouse or a neighborhood school) to take reasonable efforts to make their facilities accessible by people with disabilities. Generally, "reasonable efforts" has been defined quite broadly, with courts frowning upon organizations that claim they cannot make their facilities open to people with disabilities. Because of this part of the ABA, many buildings have installed things like wheelchair ramps or wheelchair lifts, braille signs and the like. Buildings that meet the ADA's requirements are often described by the shorthand "ADA compliant." If you are interested in knowing more about products that can help you become ADA compliant, you might consider visiting our website. We have built it with an eye towards offering useful information, and if you still have questions, we have included our contact information so that you can get ahold of us. With technology advancing every day, residential wheelchair lifts have become top of the line machines to help transport people throughout their homes. There are so many built in advances to ensure safety and convenience, you would be surprised what features are included. Since any type of vertical lift could cause a problem if it was not working properly, it is important for each model to have multiple safety features. Just like the many safety options in an elevator, residential wheelchair lifts have been improving to keep you and your loved ones safe. A residential wheelchair can be incredibly useful for homes that have multiple floors. But how can you be sure that you will be transported safely up and down throughout your home? Wheelchair lifts now have sensors that can detect if anything is going wrong. Besides being strapped in, your wheelchair lift can have under panel sensors in order to tell when it has arrived at the destination. They can even have an audio visual alarm in order to notify you immediately if there has been a problem with your lift. Rest easy knowing an emergency alarm will go off since your lift can detect if anything goes wrong. Besides fancy sensors that monitor your lift functions, residential wheel chair lifts now make it easy and convenient for you to be transported. There are manual and automatic options to operate your lift. Whether you feel more comfortable pressing a button and controlling your speed, or would rather just have the machine do it itself, it's all up to you. Your lift can even automatically place ramps on both sides of the lift so you can get on and off effortlessly. Instead of simply detecting if something goes wrong with your lift, a residential wheelchair lift has built in features to prevent issues from happening. There are cable safety devices, anti-skid surfaces, grab rails and comfortable seating to make you safe and comfortable. No longer do you have to worry about your lift stopping halfway to your floor or slipping in the lift. Wheelchair lifts have been carefully designed to make your safety the priority. If you're interested in learning more about how wheelchair lifts are more safe and convenient than ever, visit our Facebook page or look us up on Google+ today! You may not be aware of it, but buildings that are constructed today need to meet certain codes that include providing certain accessibility accommodations made for those with disabilities. It is important to do this because those who do have a disability are still a highly important part of our life, and they need to be able to enter the buildings were they work, live, shop, and worship. Universal Design helps numerous individuals to get the kind of wheelchair lifts and other accessability products they need to get their buildings up to code. The Americans with Disabilities Act requires that all employees be able to access their place of employment. Those who do not provide for individuals with disabilities are opening themselves up to a discrimination lawsuit. It is best to avoid this by having handicap lifts and the like. With those in place, the worry about a potential litigation situation disappears, at least on this matter. Purchasing the products needed to make a building up to code takes time and preparation. Not only are the products something that need to be budgeted for, but it is also true that the installation of these products takes some time. Depending on the nature of the construction of the building, more or less time may be required. Business owners have a lot of burden to bear when it comes to following building code law and not discriminating against their employees by accident. That being said, it is worth their time and efforts, because those with disabilities are just as good if not better than some of the other workers under their employee at their jobs. Let us know what your comments on Google+ and Facebook! When you think of handicap-accessible homes and facilities the first thing that often comes to mind are ramps. Ramps are an important part of the accessibility landscape, but they often require a lot of room. The higher the entrance the bigger the ramps have to be. Many individuals with smaller spaces to work with should consider residential wheelchair lifts. This is a type of vertical platform lift that takes up a minimum of space, as little as 36' x 48'. Imagine that you have a small yard, or that because of the landscaping or layout there is effectively little room outside of the building to work with. Where you would struggle to fit an adequately sized ramp (if you could get one to fit at all) a residential wheelchair lift would be able to slide in and provide a quick and easy to use option. They are also an excellent option for backyards with raised doors and/or decks. There are many things that need to change in order to make a home fully wheelchair accessible, but a ramp is not required. In many cases, neither is re-landscaping or altering decks and other outside features. A residential wheelchair lift allows you to continue to enjoy these things without the hassle and cost of remodeling them. Lifts typically come partially assembled to streamline to installation process, and once completely set up they can be operated by a single person. There is less to maintain/clean off when it snows, and the lifts themselves are extremely safe thanks to an array of sensors, emergency off switch, and a backup power source. A residential wheelchair lift is an ideal way to preserve your way of life while ensuring that your home is fully accessible. Several weeks ago, on July 8, 2013, an 11 year old girl with condition similar to cerebral palsy was denied entrance to the Ships of the Sea Maritime Museum in Savannah, Georgia, apparently because "of her wheelchair." The family had carried her up the steps to the museum and, upon attempting to enter, been told that the wheelchair was not allowed because the wheels would dirty the floors. The guide told the family that the museum policy allowed them two options: using one of their wheelchairs, specially made for the elderly or handicapped, or watching a video presentation about the museum on the bottom level, which was handicap accessible. The family ended up refusing both options and leaving, rather upset from the whole situation. It was later discovered that the guide had misinterpreted museum policy, in a statement put out by the museum curator, Wendy Melton. She explained that because of the historic standing and condition of the building, there had never been a handicap elevator installed. As a consequence, the second level of the museum was not wheelchair accessible; somehow, the guide had taken that to mean that visitors with wheelchairs were not permitted to access the second floor in any manner. Melton elaborated on this matter, stating that if the family had carried the girl to the second floor, they would've been allowed to enjoy the rest of the museum's features and exhibits as any other visitor. She issued a public statement about the misunderstanding and added that she would be apologizing to the family. The family has stated that they would not be filing any suits or complaints, just that they "really don't want this to happen to anybody else." Unfortunately, the child who had to suffer from the misunderstanding has "adamantly said no," according to the family, to the possibility of visiting the museum again in the future. This appears to be a case in which everyone suffers in some way, whether it is the curator in the museum reputation, the guide in his or her misunderstanding, or the family and the girl who had to be turned away from a relaxing day at the museum while on vacation - and all from an issue as simple as a lack of a handicap elevator. Fortunately, the museum policy was cleared up so that situations like this particular one can be avoided in the future and no more vacations in the Sea Maritime Museum ruined. An incident like this brings to mind how these days, handicap elevators, wheelchair lifts, and other devices enabling universal accessibility are not only becoming more prominent in modern structures and public institutions, but becoming mandatory. Because of the historic condition of the museum, the lack of a handicap elevator just happened to slip through the cracks. Yet, perhaps, at some point, these cracks will not so easily be overlooked. An invaluable resource for the family. A few key considerations include the type of vehicle you will be using, whether you want the lift inside or outside the vehicle, and what type of scooter or wheelchair you have. There are a wide variety of lifts available that will meet your need for portability of a scooter or wheelchair without breaking the family budget. From front-loading to hydrotherapy, walk-in to roll-in, large to small, there are options to suit your preferences. Will you be staying in your current home for a long period of time? Then an overhaul of the spaces your child will use the most will be beneficial to you in the future. Planning to move soon? Then minor adjustments can make the difference in comfort until the process of moving is complete. Either way, an investment in something that you will use daily is a great place to start. Stairs can become a hazard or a limitation to access without adaptation. Two primary accommodations include the use of ramps or stair lifts. Again, long and short-term planning will influence your decision of which to use, as well as the location in which the adjustment is needed. For interior stairs the option of a stair lift can be an affordable, safe solution to accessing upper floors of the home, particularly if the family will remain in the home for an extended period of time. When addressing outdoor needs, a vertical platform lift, a ramp, or outdoor stair lift can be an easy solution to improving access. Whether the pool is a source of therapy or relaxation, accessibility can quickly become limited when your child is as big as you! Consider a pool lift to continue enjoyment of the outdoors with the family. Become an for ADA access in your neighborhood or community by proposing affordable solutions that will increase access for all people with disabilities. If it is a limitation for your child, then it is potentially a limitation for others. Be positive in making suggestions for improvements and be willing to discuss needs. People in charge will typically be open to listening when you can help with the process of improving community experiences. Rely on experts in the industry to aide you in the process! Let us know what your experiences and comments on Google+ and Facebook! Wheelchairs are designed to help people who can't walk well or at all get around on their own. However, when it comes to traveling by vehicle, they need to have their wheelchair with them when they reach their destination. Unless someone has a small manual wheelchair that folds small enough to fit in the back of a car, truck, van or SUV, a typical vehicle won't work well, unless you install a vehicle wheelchair lift. Wheelchair lifts are available to fit just about any vehicle on the market. Large vehicles, such as trucks, vans and SUVs can accommodate lifts either inside or outside the vehicle, depending on your preferences. Cars can typically only use outside lifts. In either case, it is important to talk to the professionals about which type will work best for your particular vehicle, as well as your individual circumstances. With the use of a vehicle wheelchair lift, you are able to secure the chair to the vehicle. Even if you are able to get your chair into a vehicle without a lift, it is left to roll around as you drive. While some people are able to create their own ways of securing the chair in place, many others simply allow it to roll around, which can be unsafe and damage the wheelchair or your vehicle. It is always best to properly secure your chair with a chair lift. In addition to choosing whether you would like an inside or outside lift and finding one that fits your particular vehicle, you need to consider the type of chair you have. Some lifts are only capable of handling a manual wheelchair, while others are ideal for power chairs and the various types of mobility scooters that are available. Most vehicles are not handicap accessible. This means you need to make alterations to the vehicle so you can carry your wheelchair wherever you go. With the right vehicle wheelchair lifts, you can easily store your chair on or in your vehicle and secure it to protect it and your vehicle. With improved health care and modern medicine, many of us are living well into age 90 and beyond. As our years advance, we get set in our ways and want to stay where we are comfortable. However, due to no fault of our own many lose their balance easily and arthritis takes a toll on knees and hips. If our home has a staircase, falling will be a matter of when and not if. Stair Lifts are becoming more and more common place in homes and public buildings that don't have elevators. Take time to consider the following issues before your purchase of a stair lift. Will you and your spouse have the strength and physical ability to get into and out of the chair safely? Have you measured your staircase to make sure that a stair lift is a feasible option? Many older houses have narrow staircases and will not be able to accomodate a stair lift. Will your home need to have a custom lift built? All stairs are different and an out of the box stair lift may not be an option. Consider all the alternatives; research the various manufacturers models as well and their prices. Would you prefer a battery operated unit rather than an electrical one? If your area is prone to extended power outages you may need the battery powered system. Finally, don't be shy or deceiving about your weight. There are chairs built for 300 pounds and up. Make sure your selection will be able to carry you and anything you haul (laundry, groceries, etc.) up the staircase. A stair lift system is a big decision and should not be taken lightly. In some cases it may be easier to move into a ranch style home with everything on one floor. Most people want to stay in their home as long as possible. For those a stair lift is the logical answer. Walk-In Tubs are one of the many ways to help those with disabilities to retain a sense of dignity and independence. These tubs are much like a regular bathtub, but for one key difference: the tub has been converted to be accessible to those with limited mobility. This can be done in a variety of ways, from a full door cut-out sealed to keep the water in, to a ramp allowing a wheelchair to access a shower area. Tubs like this are a great option for those with mobility issues because in many cases, it allows them to bathe themselves. Especially for seniors or those who are newly disabled, the thought of needing help bathing can be a humiliating prospect. With a walk-in tub, this fear can be abated by allowing the disabled person to access the tub on their own and accomplish personal care tasks with greater ease. For those who like a soothing, spa-like experience, there are even walk-in tubs with air and water jet options available. This can also be beneficial because the jaccuzi-like effect can help improve circulation. Not to mention the affect is relaxing, and relaxation is beneficial to just about anyone. For those who want just a regular bathtub, a walk-in tub gives them a way to access the tub without having to step over a high ledge, which may not be possible for those with disabilities. The benefits of these types of tubs are astounding, when you think about it. After all, there are few routines more sacred to most people than personal hygiene. The walk-in tub is but one option in a gamet of those designed to help those with mobility problems, but it is definitely something to look at in the scheme of things. After all, there is nothing better than enabling someone with a disability to take charge of their life. We all know the ADA requires businesses to be accesible to handicap and wheelchair bound citizens-to an extent. Based on the fact that 25 million people worldwide are handicap and 1.6 million are wheelchair bound in America alone, it is sade to say that most of us know someone in a wheelchair. You also probably know that the requirements by the ADA can be helpful to these people-to an extent. 1. Is the Ramp Really Enough? We all know the ADA requires businesses to provide ramps for wheelchair bound customers and handicap individuals next to their stairs. However, it can be an inconvenience and sometimes require a lot of effort for these folks. Universal Accessibility provides some great products like Handicap Lifts and Stair Lifts that are perfect for these situations and come at a reasonable cost! These customers of businesses have to work enough already in their day to day lives, so why make them work when they are enjoying their leisurely time? Businesses that go this extra mile in installing Handicap Lifts or Stair Lifts along with ramps don't just please and comfort those 1.6 million people, but they show the rest of the world that every customer, no matter the disability, is a priority. 2. It's Just Good For Business. Universal Accessibility has the mission of making homes, businesses and public places handicap accessible. This means everything from Stair Lifts to Vertical Platform Lifts. We can provide Universal Designs for businesses to help them reach customers that may need the extra help in getting from Point A to Point B or customers that truly do need and demand the extra help like so many wheelchair bound citizens mentioned before. By looking at where your business was forced to meet ADA guidelines and asking yourself what else you could do beyond the requirements, you are putting your customer first. Accessibility is something customers with disabilities crave and every customer appreciates. Why not a Stair Lift to fit alongside that ramp or a Vertical Platform Lift for certain sections of your business? As a business, you know what is right and what you need and we are here to help! According to U.S. Census Bureau data, more than 50 million Americans are believed to be coping with health issues that impact their ability to independently carry out activities of daily living. Perhaps you or a loved one falls within that category. If you do, you may want to consider installing a dumbwaiter. It may be able to alleviate some accessibility issues for you. Just in case you are not familiar with them, dumbwaiters are designed to transport small to modest size items from one floor of a building to another. Thus, they are ideal for people that have difficulty carrying moderately heavy items or negotiating stairs. Items typically transported by dumbwaiters include, but are not limited to food service trays, medicines and bed linens. The dumbwaiter’s shaft, car and mechanisms are frequently installed inside of a hollow wall that is located near an electrical outlet. However, not all dumbwaiters require electricity. Some may be operated manually. The manual units tend to be suitable for those that have sufficient upper body strength to manipulate the dumbwaiter’s pulley system. It is also important to note that the dumbwaiter’s cars can be configured in a variety of ways. Thus, they are suitable for most homes’ layouts. Providing that it is medically necessary, the costs of obtaining a dumbwaiter may be tax deductible or paid for through home based and community services’ waiver programs. You may also be able to receive installation assistance through non-profit and volunteer organizations like Home Free Home, Habitat for Humanity and Rebuilding Together. Is a Commercial Wheelchair Lift Right for You? With the invention of wheelchair ramps and elevators, came more freedom for the wheelchair-bound public. Along with those inventions, also came more opportunities for business owners to cater to the needs of their disabled patrons. While ramps and elevators are wonderful tools for business owners and their customers, they do have their bad points. Elevators are, for the most part, safe and convenient but they come with enormous installation costs, in fact the estimated cost to install an elevator is between $15,000 and $30,000. Ramps are another story, trying to get the correct height, with the precise pitch, in the smallest space possible, can pose a logistical nightmare. Not to mention ramps can be downright unsafe. Even if the ramps themselves are indoors they can get slick when rain or snow is tracked inside or someone could lose their hand-hold on the wheelchair, causing it to roll down the ramp out of control. There are many injuries, and lawsuits, every year involving wheelchair ramp accidents. Fortunately, now you have other options, one of which is the AmeriGlide Hercules II 600 Commercial Vertical Wheelchair Lift. Much like an elevator in its make-up, the Hercules II 600 wheel chair lift, allows disabled people to move up or down a level. It is easy to use; the person in the wheel chair simply rolls onto the lift platform and uses the control button to move the lift from a lower level up to a higher level or vice versa. Once on the new level the passenger merely rolls out of the lift gate. Wheel chair lifts are very safe. There are sensors located along the bottom of the lift to stop it immediately if it encounters any obstacles. There is an automatic folding ramp that provides easy entry, and adds stability when the lift is in motion. There is a backup battery in case of power outage. Lifts also have an emergency stop button, as well as a constant pressure rocker switch. The AmeriGlide Hercules II 600 Commercial Vertical Wheelchair Lift is a safe, secure, and cost effective way to give your clients and customers the freedom and mobility they deserve. Let Universal Accessibility help you decide if a vertical wheelchair lift is right for your business. Let us know what your experiences or thoughts are on ADA compliance on Google+ and Facebook! Some people never even think about the fact that they won't be able to get up or down the stairs in their own home. It becomes a reality to an astonishing number of Americans each year. Many of them automatically think that moving is the smartest decision; but is moving really the most affordable or convenient option? In most cases it's not. Stair lifts are more customizable than ever before, with some models having the ability to maneuver curves, landings, or even any type of staircase you can think of! That customized staircase you were so proud of when you built the house is no longer an obstacle. It does not matter if it is a graceful spiral, has a 90° turn, 180° turn, or has multiple landings. Getting up and down it can be accomplished. Modern technology has gone far beyond computers and into architectural design for universal accessibility. Stair lifts come in an electric version or they can battery operated. The latter may be a consideration if you live in an area that has frequent power outages. The installation ranges from the do-it-your-self, to having it fully installed. This accessibility offers you long-term reliability. Down the road, if walking becomes harder… having a means of mobility available on the first and second floor, such as a wheelchair, means you can remain in your home for a long as you feel comfortable getting around. There is something special about being able to stay in a home that feels like home, because it is your home. Why try to recreate a home elsewhere, when, with the proper equipment, you can stay right where you want to be. Check our site and explore all that we have available for finding increased means of mobility. Keep Up With The Times - You may have been proactive when you initially had those wheelchair ramps professionally installed decades ago. But, have you inspected them lately to make sure they're still up to code? All structures wear down over time and anything related to disability access should be inspected periodically to make sure it still meets regulations. Some examples are; wheelchair ramps, handicap parking spots that may have faded lines or deterioriating signage, access to sidewalks and other entry ways can wear and become dangerous, and of course there is much, much more. Be smart; regularly examine and inspect your building for all these potential problems. Train Your Employees - One of the best ways to keep your business ADA compliant is by raising awareness among everyone that works for you. If you train your employees on how to best respond to requests for accomodations or questions regarding ADA, you are very likely to avoid any severe problems or litigation stemming from these issues. A nice side benefit of a well-trained workforce is that one of those sharp and aware employees may just notice a crumbling walkway or not-so-new wheelchair ramp and take action before anything undesireable happens. Work With Only The Best - Perhaps the best way to avoid any potential problems regarding the ADA is by hiring an ADA expert to work with you, proactively rather than against you reactively. It is recommended to hire someone to routinely inspect your place of business on an annual basis. This serves the dual purpose of showing good faith, should an unfortunate situation arise at any time in the future as well. So what is Universal Design? The concept was coined by architect Ronald L. Mace, who wanted his colleagues to design buildings that were accessible to all, regardless of age or ability. While the idea started with buildings, there are now people pushing the concept in a nuber of other areas, including everything from sidewalk curb cuts to dishes that can be used by people with low vision or dexterity issues. There are even Universal Design conferences that serve as both a showcase and an educational opportunity for people in a wide variety of fields. A lot of the attendees will range from landscape and building architects and contractors to housing agency staff and code officials. They bring together the everyday accessibility issues they encounter and the ideas they have developed to meet those challenges. Through lectures, discussions, exhibits and tours of model area projects, attendees will be exposed to new ideas and probably generate some of their own. There are literally millions of homes that already exist, where some types of accommodations are needed now, or will be needed soon, so that people can fully function in the home that they have. There are a variety of resources available on adapting homes using universal design principles, so if you are facing accessibility limitations in your home, do a search for "universal design," or check out some of the many books that have been written on the topic. There is also a Google+ Community centered around Universal Design, so check it out! Let us know what your experiences or thoughts are on Universal Design on Google+ and Facebook! Before Congress passed the Americans with Disabilities Act in 1992, equality did not apply to people with a handicap. Since then, homes, businesses and marketplaces serving the public must also be accessible to a person with a handicap. Often, the only item that comes between a person with a disability and an assistive device is the cash to make the purchase. If the person with a handicap is also receiving SSDI, chances are the cash will need to come from another source. Until the age of technology and the internet, those sources were very limited and subject to many conditions. Today, we have a source that has become very popular over the past couple of years: crowd-funding. Based on the premise that it takes a village to raise a child, many small contributions help reach the cost goal of an assistive device. The crowd grows exponentially relative to the size of the social network of choice. Most contributions will come from perfect strangers although an email list of family and close friends usually starts the ball rolling. You need to walk the proverbial mile in shoes worn by a person with a handicap to know what assistive devices will improve the quality of life. It would help you understand that shelf-reachers, wheelchairs, power scooters, canes, ramps, stair lifts, vehicle lifts and many more items are not luxuries. They are necessities that will lead to the next degree of independence. A sponsored grant could take up to a year. Applications to a research organization working on your disability will require proof and paperwork. Crowd-funding can happen overnight or take as much as 60 days. If you had to choose, crowd funding is the least complicated, has the most people and happens much quicker, which eliminates the frustration likely to occur when pursuing other avenues. Where do I find Crowd-Funding? Where are these crowd funding sites located? An online search for “crowd-funding for individual needs” will reveal the most effective sites available for this purpose. Choose one – or more that seem easiest to use and good luck! Let us know what types of options you or your family have used to obtain funding for making your home accessible on Google+ and Facebook! The 1992 Americans with Disabilities Act requires that businesses which provide goods or services to the public be made accessible to persons with disabilities. To help small businesses understand their obligations under the law, the Small Business Administration created a brochure outlining requirements in nontechnical language. We’ve summed up the most important points of that document here. Parking spaces that are too narrow for vans with lifts or customers who must retrieve wheelchairs from vehicles. Businesses must provide designated parking with an access aisle that is at least 8 feet wide for vans and 5 feet wide for cars. Steps or curbs at the main entrance. A front-entrance ramp must be provided that allows access to doors that are open during business hours. If there is not room for a ramp, a lift may be installed. Round doorknobs or hard-to-grasp handles. A lever or loop handle is more easily manipulated. Doors that are too narrow for wheelchairs. A minimum width of 36 inches is required. Narrow revolving turnstiles. They can either be removed or supplemented with gate entrances. Aisles that are too narrow for wheelchairs. A 36-inch clear aisle width is necessary, with a 3-foot by 3-foot turning space at the end of aisles. Shelves that are inaccessible to people in wheelchairs. Since it is not feasible to have everything within reach, store personnel must be available to assist shoppers with items on high shelves. Checkout counters that are too high for those in wheelchairs. Counters should be at least 36 inches long and not more than 36 inches above the floor. A space of 30 inches by 48 inches is required to accommodate a wheelchair in front of the counter. Dining tables that are too low. Five percent of the seating in restaurants must be wheelchair accessible, with a height of no more than 34 inches and no less than 28 inches. These tables should be available to anyone in the restaurant, and not solely the disabled. The above points cover the main requirements of the ADA; questions as to what applies to your business can be directed to the Disability and Business Technical Assistance Centers at 1-800-949-4232. For information on tax credits and deductions available to help small businesses comply with the law, call the ADA information line at 1-800-514-0301. Our mobility experts at Universal Accessibility have helped people across the country for over a decade make their businesses more accessible for the disabled. You can reach one of our experienced staff at 1 (800) 470-8940. Share your thoughts and comments with us on Google+ and Facebook! Disabled veterans may be able to secure funding for wheelchair lifts and other accessibility improvements from the Department of Veterans Affairs. The VA provides grant funding to qualified disabled veterans so they can make safety improvements in their homes. There are three types of funding available from the VA.
A Home Improvements and Structural Alterations (HISA) grant can be used for safety improvements such as wheelchair ramps, wheelchair lifts, stair lifts and other structural improvements in the kitchen and bathroom. Funding levels for the HISA grant are determined by a veteran’s service connection. For example, if a veteran was injured while serving in active duty military, he or she would like qualify for a larger grant. Veterans with a 50-to-100 percent service connection may be eligible for up to $4,100 from this grant. Disabled veterans who are not service connected can receive up to $1,200 in HISA grant funding. Money for safety improvements like wheelchair lifts can also be secured through the Specially Adapted Housing (SAH) grant. This grant can be used to make major changes to a veteran’s home that allows the veteran to remain living independently. Veterans who received a permanent disability while serving in active duty can apply for a grant of up to $50,000. Another type of grant – the Special Home Adaptation (SHA) grant – can be used by service-connected veterans to improve mobility in their homes. Maximum funding is $10,000 and is available to veterans who have a permanent disability resulting from his or her military service. Veterans who qualify can use this grant money to install wheelchair lifts, renovate kitchens, build ramps and make many other types of accessibility improvements in their homes. Veterans can easily apply for a HISA grant by completing this document and submitting it to a VA medical center. Veterans can seek a SAH or SHA grant by completing this document and submitting it to a regional office. For more information, call 1-800-827-1000 or visit HISA and SAH/SHA. Feel like the days of an enjoyable soak in a nice warm bath are over because you cannot step over the side of a bathtub? Far from it. As a matter of fact, with one of our Walk-In Tubs you might end up enjoying baths more than ever! Let's face it, we all love a warm bath. Warm baths can help with relaxation, tension relief, alleviating muscle aches, reducing insomnia, and improving circulation. Plus, they just feel good! Everyone should have the opportunity to easily enjoy a nice soak from time to time. And did we mention that we can add air or water jet systems to many of our Walk-In Tubs? Your bathtub can be turned into a personal jacuzzi. At this rate, you'll never want to get out of the tub! On a practical level, bath and shower conversion kits allow the user more security, privacy, and dignity. Safety rails, doors that open in and out for walk-in or wheelchair use, and a variety of sizes and models allow you to customize the bathtub or shower unit to the specific needs of the person using it. Not sure which one of the Walk-In Tubs works best for you? Don't worry, you are not making this decision alone. We can assist you every inch of the way, from determining which package works best for you to the final installation. Walk-In Tubs will allow you and your loved ones to enjoy all the positive features of tub bathing without the danger of slipping and falling. Let us know what has made your walk-in tub more enjoyable on Google+ and Facebook! As spring gets into full swing in many areas, home shows and home improvement events are usually popular. This year, due to the continued uncertainty related to the economy, many people are reluctant to seek out new homes, preferring to invest their limited resources in renovating the property that they already have. Perhaps you or your loved ones live in an older home, or one that simply does not accommodate you in the ways that you need. Nursing homes, group homes, and rehabilitation centers are all potential choices when faced with the issue of limited mobility in your own home. Regardless of whether the problems are due to age or to a specific medical condition, there are several ways that you can increase your level of self-sufficiency. You don’t have to leave the home that you love. Rather, make each floor accessible by installing a stair lift, either inside the home or outside for exterior staircases. Our stair lifts by AmeriGlide are safe and comfortable. Reduce risk of falls and other injuries. A wise financial investment, stair lifts can increase the value of your home, as well as help you avoid costs that you’d otherwise be paying to a facility (such as monthly rent). Universal Accessibility will help you make every section of your home accessible. You can either install the stair lift yourself or take advantage of our installation service. We also provide expert advice via our toll-free number, and we can answer any questions you may have after your stair lift and any other devices have been installed. Let us know what you have done to your home with to make it more accessible on Google+ or Facebook! For some people it is difficult to envision life with a mobility handicap. You might always have to be seated in a wheelchair or scooter. You might have to depend on someone else to push your chair or drive you around. It is difficult to pick some things up or even to keep yourself as clean as you wish at times. Perhaps most frustrating, how do you enter or exit your residence? Many, if not most, houses have entrances with steps attached to the front ledge or porch. This is a huge problem for a person with impaired mobility. Universal Accessibility is devoted to solving this problem. There are only a few ways to bypass stairs while staying seated on your wheelchair or scooter- ramps, wheelchair lifts, or incline platform lifts. Ramps can be unsightly and sometimes destroy the possibility of a front yard or garden. They can also be steep, slippery, and a pain to maneuver up and down on a daily basis. Wheelchair lifts can be much easier and Universal Accessibility can help you plan and fit one to your home. These lifts have to be built to fit the architectural specifications of the house with a power source, and a flat, sturdy foundation underneath. We walk you through this process of planning for the installation of a vertical lift one step at a time, too. The wheelchair lift takes very little room and is not very conspicuous on the house. The rider opens a latched gate, rolls onto the lift deck, turns a key that unlocks the power switch, pushes with very little pressure on a rocker plate and then enjoys the ride, which is smooth and unhurried. When the lift stops at door level, the passenger rolls off the lift and enters the residence. It is a very easy and comfortable process. Let us know what your experiences have been like outfitting your home with a vertical wheelchair lift on Google+ or Facebook! Getting older brings about changes in your body that may make it difficult to get around in your home. Making a few simple modifications can improve the accessibility in your home and allow you to "age in place" rather than in some type of senior housing or a nursing home. One of the most frustrating things someone with a disability or mobility problems deals with can be the fact that getting into and out of the home is is just difficult! Most of the time because of the entry steps to the front porch. Vertical platform lifts (VPLs) make these situations easy to deal with and are much more simple than moving to a new home. Careful planning is required for these lifts, but many locations are already fit pretty well for installing a vertical lift. So if you feel like you're getting out and about less often just because of the difficulty you face getting out of your own home, purchasing a VPL may be a good choice. Bathtubs can be hazardous for a person with mobility issues. In fact, according to the Centers for Disease Control and Prevention, some 234,000 people fall in a bathroom and require treatment at a hospital each year. Falls often occur in the bathroom because surfaces become slippery when you bathe. People who are not steady on their feet are likely to fall when getting into or out of a bathtub. To lessen the chances of falling, the tub should be fitted with a walk-in tub or shower. That way, you don't have to negotiate the side of the tub to take a shower. And, you don't have to worry about trying to get up from a seated position in the wet, slippery tub. To reduce the risk of falling, you should also put non-slip surfaces and grab bars inside & outside the walk-in shower or tub. Falls are one of the leading causes of injury-related death among people over the age of 65. Many falls occur on staircases, especially if you have mobility issues due to your age or a disability. Make sure staircases are well-lit and free of tripping hazards. Another way to improve accessibility is by installing a stair lift. Stair lifts are fairly easy to install and require very little maintenance. They don't take up a lot of room on your staircase. But most importantly, they provide an effective means of getting up and down the stairs safely, without worrying about taking a fall. Let us know if you have any tips or what you may have done around your home to make it more accessible on Google+ or Facebook! For the first 30 years of his career, Joe Brown worked on the implementation of computer software offerings focusing on taxation and banking systems. 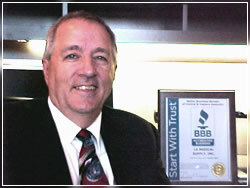 In 1994 Joe founded Infovisa, Inc. with the goal of providing trust accounting systems to local banks. After serving as CEO of Infovisa for 7 years, Joe decided to change directions in 2000 selling his business interests in Infovisa and founding 1A Medical Supply, Inc. 1A Medical Supply has now been serving the mobility marketplace since 2001. Joe envisioned a company offering mobility products via the Internet but with an intense focus on building one-on-one relationships with each customer. Today, Universal Accessibility is achieving that vision everyday as part of the 1A Medical Supply network. 1A Medical Supply sells, installs, services, and offers consultations for a wide variety of mobility products in all 50 states as well as other parts of the world. Products as complex as commercial handicap facilities that require elevators or industrial ramps to meet ADA specifications are installed every month. By focusing on customer service and customer communications 1A Medical Supply has become a leader in the world of mobility solutions.